Definition at line 147 of file CSparseMatrix.h. Definition at line 389 of file CSparseMatrix.cpp. References C_INVALID_INDEX, CCompressedColumnFormat::getColumnStart(), CCompressedColumnFormat::getRowIndex(), mpColumnIndex, mpMatrix, mpRowIndex, mRowIndex, and CCompressedColumnFormat::numRows(). Definition at line 409 of file CSparseMatrix.cpp. 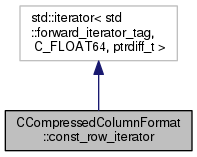 Definition at line 418 of file CSparseMatrix.cpp. Definition at line 465 of file CSparseMatrix.cpp. Definition at line 427 of file CSparseMatrix.cpp. Dereference operator * returns the node the iterator points to. Definition at line 421 of file CSparseMatrix.cpp. Definition at line 442 of file CSparseMatrix.cpp. 446 mpRowIndex++; // We need to make at least one step forward. Definition at line 424 of file CSparseMatrix.cpp. Definition at line 430 of file CSparseMatrix.cpp. References mColumnIndex, mpColumnIndex, mpCurrent, mpMatrix, CCompressedColumnFormat::mpRowIndex, mpRowIndex, and mRowIndex. Definition at line 212 of file CSparseMatrix.h. Definition at line 214 of file CSparseMatrix.h. Referenced by const_row_iterator(), and operator=(). Definition at line 216 of file CSparseMatrix.h. Referenced by operator!=(), and operator=(). Definition at line 206 of file CSparseMatrix.h. Definition at line 210 of file CSparseMatrix.h. Definition at line 208 of file CSparseMatrix.h.